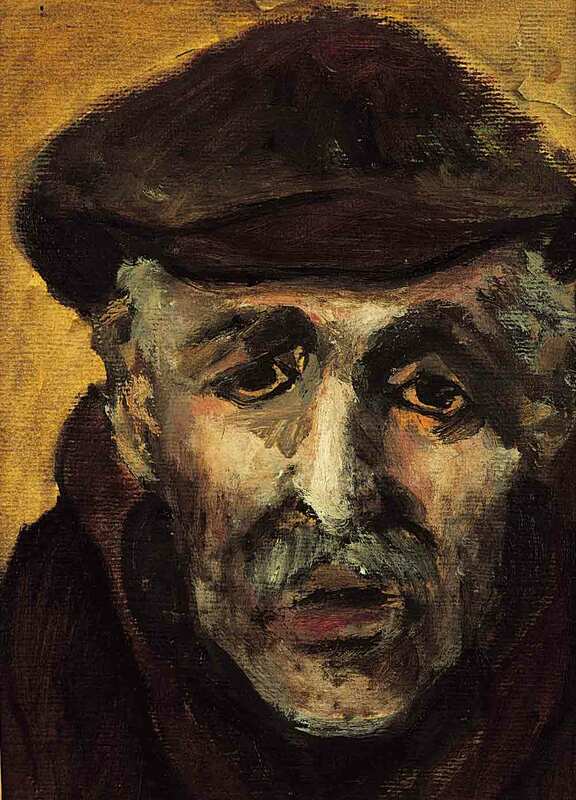 description This head of an elderly, grey-haired man, seen in full face view, with dark and deepset eyes staring out towards the viewer above a drooping moustache that frames a half-opened mouth, is perhaps Frankfurther's most powerful individual portrait. Wearing a dark brown cap and overcoat, the collars of which are tightly pulled up around his neck, his head is set against a vivid, mustard-coloured background. Paint has been skilfully applied to a toothed paper in energetic, expressive brushstrokes, building to areas of deep impasto around the forehead, nose and cheeks, in a palette ranging from burnt sienna through to green to outline the worn contours and skin tones of a face that has lived through much. This is probably the portrait that Frankfurther showed at the East End Academy's annual exhibition at the Whitechapel Art Gallery in the winter of 1953 under the title 'Portrait of a Man', where the critic of the 'Jewish Chronicle' observed that 'there are some good paintings, notably ... by Eva Frankfurther' and the 'Hackney Gazette' noted that 'the most memorable works are those by Eva Frankfurther, who has gone back and recreated the past of Whitechapel'. In a similar vein, the critic of the 'Birmingham Gazette' noted that 'A teashop waitress has painted some of the most affective [sic] of the 300 pictures in this year's East End Acadmey. There is nothing sugary-cakey about Eva Frankfurther's dark, sombre portraits of an old man and a Jew, and her Whitechapel sketches of a worker rolling pastry and a bent crone shuffling along the streets with a parcel under her arm.' The same article also appeared in the 'Yorkshire Observer' in Bradford, under the headline "The Waitress' Eye". exhibition history 'East End Academy: An Annual Exhibition of Paintings by People Who Live and Work in East London', Whitechapel Art Gallery, London, 29 Nov-31 Dec 1953, as (81) 'Portrait of a Man', £8; 'Refiguring the 50s: Joan Eardley, Sheila Fell, Eva Frankfurther, Josef Herman and L S Lowry', Ben Uri Gallery and Museum, 108A Boundary Road, London, NW8 ORH, 14 Nov 2014-22 Feb 2015, (35). literature Anon., 'Birmingham Gazette', 28 November 1953; "The Waitress' Eye", 'Yorkshire Observer', Bradford, 28 November 1953; Anon., 'Jewish Chronicle', 11 December 1953; ed., B. Planskoy, 'Eva Frankfurther 1930-1959: Paintings, lithographs and drawings' (London: Peter Halban, 2001), illus., p. 42; ed., S. MacDougall, 'Refiguring the 50s: Joan Eardley, Sheila Fell, Eva Frankfurther, Josef Herman, L S Lowry' (London: Ben Uri Gallery, 2014), p. 33.